Gustav Holst was born in Cheltenham in 1874. He began composing while at Cheltenham Grammar School and spent two months at Oxford learning counterpoint before being sent to London to study composition under Stanford at the Royal College of Music. Stanford found him hardworking but not at all brilliant and their lessons were often frustrating. He met Ralph Vaughan Williams in 1895, the two quickly becoming friends and beginning their lifelong habit of playing sketches of their newest compositions to each other. At college he also learnt Sanskrit at University College, London and whilst he was never fluent, he was able to read from the Ramayana and the Mahabharata and to translate hymns from the Rig Veda. Holst left college in 1898, playing the trombone in the Carl Rosa Opera Company and later Scottish Opera. He married Isobel Harrison in 1901 and taught at the James Allen's Girls' School in Dulwich for two years before being appointed Director of Music at St. Paul's Girls' School in Hammersmith in 1905, where he continued to teach until the end of his life. Holst's heavy and exhausting teaching schedule meant that time left available for composition was often fragmented. It took him more than two years to write The Planets (1914-16), a work he never considered to be his best. The immediate success of this work was a source of consternation to the composer. Between 1920 and 1923 Holst's working life became increasingly demanding: he was teaching at the RCM and University College, Reading, as well as conducting and recording. His popularity as a composer reached its height, as indeed did the level of stress. For the whole of 1924 Holst was ordered by his doctor to cancel all professional engagements and to live in the country, where he was able to continue composing. On his return to London in 1925 he gave up all teaching except at St. Paul's. 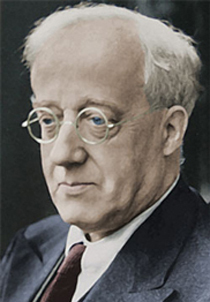 His later works, such as the Choral Symphony (1923-4) and Egdon Heath (1927) for orchestra, which he believed to be his best, were found by critics and audiences alike to be bewildering and too 'cerebral' but Holst remained confident and unperturbed. The years from 1927 to 1933 were the most creative period of the composer's life. The town of Cheltenham organised a Holst Festival in 1927 with concerts at the Town Hall. In his final years Holst was to remember it as the most overwhelming musical event of his life. He accepted the Howland Memorial Prize from Yale University in 1929 for distinction in the arts and the gold medal of the Royal Philharmonic Society in 1930. He was appointed visiting lecturer in composition at Harvard University in January 1932 but soon after became ill. On his return to England in the summer of that year, Holst's health continued to decline. He died on 25 May 1934.